Let’s now step over to your pond. That Green Darner protecting its territory above the water is capable of devouring 600 mosquitoes a day. Hence his nickname, Mosquito Hawk. It’s one of the largest U.S. pond dragonflies and, from an insect’s standpoint, not to be messed with. It patrols its territory with zeal and lethality. An aerial acrobat, it can hover, turn on a dime at high speeds and fly at 35 (some report 55) miles per hour. It’s harmless to humans, but insects best beware. The Green Darner hasn’t always been aloft. It started its life in water, when its mother deposited its egg on the stem of an aquatic plant, just below the surface of the water. Two weeks later it hatched in the water, looking nothing at all like a dragonfly. Brown and wingless, with bulbous eyes and a pudgy abdomen, soon it was hiding in vegetation and ambushing small aquatic insects that passed by. Over the course of time, it outgrew its skin and had to shed it 10 to 14 times before it reached adult size. Except for the final time, it did this all underwater, spending its entire first year there, riding out the winter’s killing freezes by staying at the muddy, but warmer, bottom. As the next spring slowly emerged, the young dragonfly did, too. Day by day, it moved closer to the water’s surface until there came a day when its head and upper body rose above it. It clung to a water plant for the next two days before climbing the rest of the way out. After that, something magic happened! First, its skin swelled and split open. Then its entire body popped out, transformed into the flying creature we can identify now as a dragonfly. 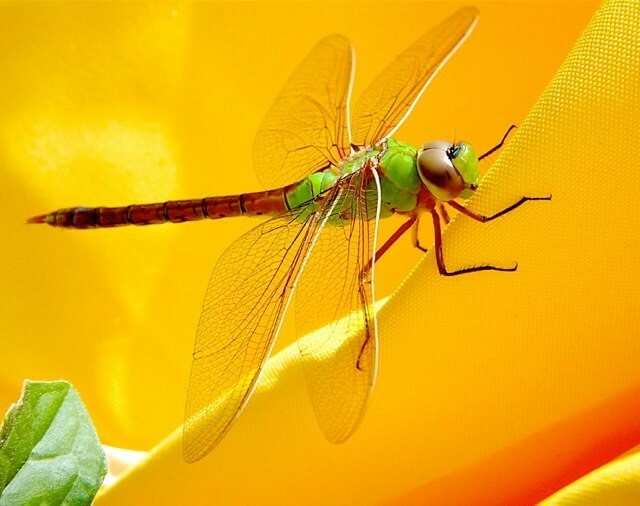 Between late July and mid-October, with a peak in September, huge swarms of Green Darners and other dragonfly species — sometimes numbering millions of individuals — migrate along lakeshores and seacoasts. 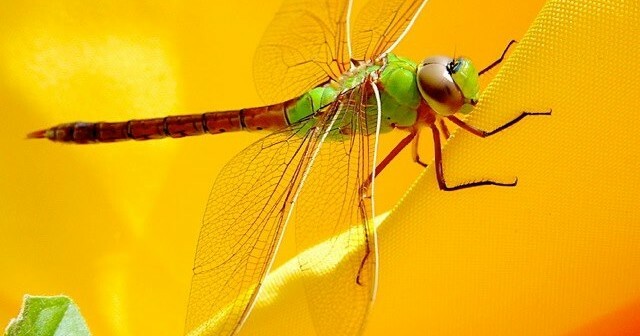 Dragonflies and birds have several migratory similarities, which include resting in the same places and following the same landmarks. Unlike birds, however, dragonfly trips are always one-way, with the offspring making the return trip. In the insect-rich habitat of your yard, dragonflies aren’t the only voracious predators. Remember the ladybug we saw in the flower garden? There are about 400 species of ladybugs in the U.S. To entomologists, ladybugs are “ladybird beetles.” Some are named for the number of spots on their elytra (hard-surfaced covers that fold over the back, protecting the underlying fragile wings), making it easy to identify them as to species. 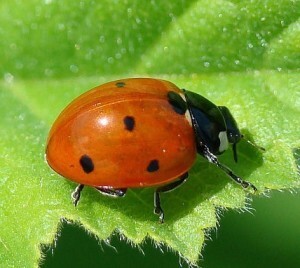 For instance, the Seven-spotted ladybug has seven black spots on its elytra. 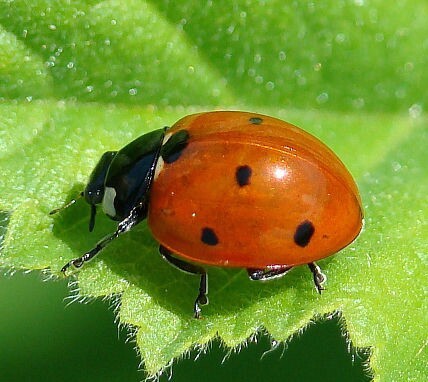 The Two-spotted Lady Beetle has two spots. The fifteen-spotted has, yes, 15 spots. The ladybug is a rare example of an insect we think is cute — tiny, shiny, colorful and harmless to humans. It’s hard to believe these insects can be another insect’s greatest nightmare. It turns out there’s nothing lady-like about this beetle, and the “lady” bug is sometimes a “he.” Ladybugs feed voraciously on scale insects, thrips, fruit flies, spider mites, mealybugs, whiteflies and just about anything else small enough for them to overwhelm. Our plants love ladybugs — each can consume up to 50 or more aphids a day. Ladybug larvae (the immature form that hatches from the egg) look something like tiny alligators, and they’re as deadly as their parents, chowing down on as many as 25 aphids a day. Ladybugs are in the envious position of being predators that are not often preyed on themselves. In the insect world, that’s a charmed existence. They’re toxic to most small predators, and they also can emit an oily, distasteful fluid from their joints that repels predators (including humans, if we handle them too roughly). Harvestmen can be smelly, too. Only instead of coming from their joints, a liquid that smells something like walnuts or horseradish gets emitted through the pores on each side of their body. Humans don’t detect it much, but toads and birds, which are among their enemies, are repelled. Harvestmen like darkness and humidity, so look under fallen logs or at the base of tree trunks. They like doing their work at night, although they have been known to be out and about in the daytime. They’re not only predators of insects, but scavengers who also enjoy a meal of fruit, veggies, fungi, bird dung and decaying carcasses. Harvestmen are not insects. They belong to the same scientific class as spiders, but to a different order. 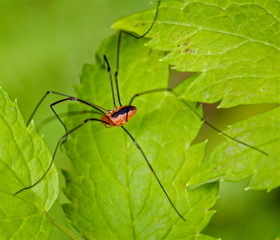 You probably know them as “daddy longlegs,” for their exceptionally long legs on a small body. 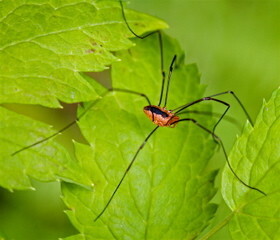 Confusingly, there are species of spiders with very long legs that are also called daddy longlegs. What separates the two is that spiders have a “waist,” produce silk and have fangs, while Harvestmen lack all three features. One of the Harvestmen species is noted for congregating en masse (hundreds, sometimes thousands) in dark, humid places, their legs all a-tangle. Harvestmen are not dangerous to humans, and your garden is benefiting from them. (The “daddy longlegs” you recently saw living in your house is almost certainly a spider, because harvestmen prefer the outdoors.) Harvestmen are mostly nocturnal, but you might occasionally see them about in the daytime. Another nocturnal species is one you know well — the firefly, or lightning bug. They rest on foliage in the daytime. It’s when the sun goes down, of course, that we see them strutting their stuff. Their “fire” isn’t fire and their “lightning” isn’t that, either. Not only that, but they also aren’t “bugs” or flies! Who named these guys? Fireflies are beetles. The adults, heralds of early summer so welcomed by children of yesteryear, use flashing light as a means of communication. The light results from a chemical reaction in their abdomen and can be controlled by them very precisely. Fireflies of different species flash distinctly different patterns of light. Many neighborhoods have all but lost their fireflies because of soil degradation, pesticide use and the disappearance of surface water. Some people haven’t seen a firefly since childhood. But at night, a healthy, wildlife-friendly yard is like a giant, twinkling Christmas tree, with hundreds of friendly lights — off and on, off and on, from the ground to the tops of trees. Some of the flashes are from males, who are fluttering around trying to catch the eye of a female — “I’m over here, look at me, look at me!” The females, dignified and sedate, sit on vegetation, watching the hopefuls beg for attention. When a female sees a flasher she likes and she’s ready to mate, she responds with a flirty flash of her own. With this, the couple dialogues via flashes and courtship ensues, the male drawing closer and closer. Finally, they meet and their brief romance is consummated. The female lays softly glowing eggs, from which glowing, hungry caterpillars hatch. The caterpillars feed on slugs and snails, as well as earthworms, dead animals and other organic matter. This makes them welcome residents of our gardens. They will overwinter and next year emerge as flying, blinking adults to brighten your child’s summer evening.